Asphalt based aluminum protects against moisture and damaging UV rays for energy savings up to 20%. Covers approx. 50 sq. ft. per gallon. 100% acrylic elastomeric resin to keep interiors cooler with energy savings of up to 35%. Covers approx. 75-100 sq. ft. per gallon. Water-based, specifically formulated with 100% acrylic resin for mobile homes. 5-year guarantee. Remains flexible from -10° to 160° F. No mixing, soap and water cleanup when wet. Class A fire rating. No hazardous chemicals or solvents. VOC=less than 60 grams/liter. UL approved. 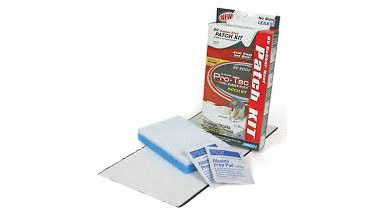 KST White Acrylic Patching Cement patches tough leaks and won't run or sag! After application it retains its flexibility to resist cracking, peeling, and blistering. 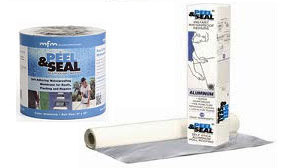 All-weather, clear, elastic sealant with excellent adhesion. Ideal for sealing leaks around vents, gutters, skylights and other roof materials when an invisible patch is desired. Asphalt sealer-filler patches cracks in roofing, firewalls, chimneys, gutters, flashing, etc. particularly for emergency repairs of wet surfaces. Apply with standard caulking gun. Cleanup with paint thinner or mineral spirits. Flexible. Cannot be painted. A heavy-duty, fibered repair mastic, designed to patch roof surfaces. Use in wet or dry conditions to seal and stop leaks around flashings, skylights, vent pipes, chimneys, and valleys. Wet R Dri Roof Cement is ideal for the repair of cracks, seams, and holes in all roofing materials. It is also excellent for use below grade in heavy duty foundation water-proofing and damp-proofing. Product is formulated for year round use. Stops roof leaks. Use in wet or dry conditions. Use for repair or new construction. Fiber reinforced. Thick trowl grade. Seal leaks around flashings,skylights, vent pipes, chimneys and valleys. Ideal for the repair of cracks, seams and holes in all roofing materials. The fast and easy way to mend your rubber roof. Just peel and seal for a permanent no-leak repair. Includes: 2 - Alcohol wipes, 1 - Scrub pad, 1 - 6" x 12" Patch. 1-1/8" dia. steel washer with neoprene backing for the best roof leak resistance. Self-stick roof covering reduces roof temperatures as much as 22.5% and resists UV radiation. Durable, multi-layers resist abrasion, self-seals around most punctures, needs no additional coating. Stretches to allow for building movement, won't crack or dry out, impervious to fungus, algae or bacteria. Rolls are 33.5' long. Remove snow from your roof from ground level, without climbing on ladders or on the roof. Prevents ice dams, saves costly repairs - insurance industry recommended. Constructed of ultra lightweight aluminum and telescopes to 16'. The bracing is located on the top of the blade resulting in no interference with snow removal. The telescoping handle come with snap-pin engagements for easy assembly and storage. 16' snow roof rake. 3 section telescoping handle. 82".